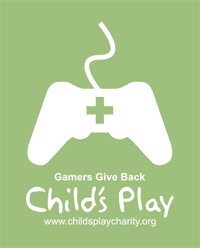 As of July 1st, 2011, we have so far raised and donated $20,680.30 for Child's Play! That's $2350.97 since our April update, all of which is going directly to the charity. We'll keep everyone posted on how the donations are doing. Once again, we're ecstatic to continue our on-going contribution! Especially pleased to be considered a platinum sponsor for such a worthy cause.